I don't know about you but I find a recipe that hardly requires any advance planning, that you can mix together in a bowl without any special equipment, and be done in a flash, to be hard to resist. If such a recipe involves chocolate and/or cookies, I'll surely be in the kitchen. You really can make these cookies in a flash. Place chocolate hazelnut spread, sugar, and an egg into a bowl and start mixing it together with a sturdy spatula or spoon. Next, I added white whole wheat flour with a pinch of salt, stirring until almost combined. Then finally, I stirred in mini chocolate chips and a slightly smaller amount of chopped toasted hazelnuts (the nuts are my optional addition; I think it works really well here but if you can certainly omit it). Scoop the cookies into 6 mounds. Bake in a 350 degree oven for about 10 minutes. They should be set but will be soft to the touch. I let the cookies cool on the baking sheet on top of a wire rack until firm enough to remove. You know what to do next...eat! Or set them aside to share with your loved ones, preferably both. These were both easy and fun to make and eat - great paired with a strong cup of tea or coffee. It will appeal to those with a sweet tooth who like a moist and chewy cookie. I must admit that I also saw David Lebovitz post some very tempting chocolate-chocolate chip cookies that I am eager to make now as well! It's a good thing we have so much room in our hearts and tummies for chocolate cookies! Again, I hope you agree. Place chocolate hazelnut spread, sugar, and egg together in a medium-bowl and stir together with a spoon or sturdy rubber spatula (do not use a mixer). Add flour and salt, stirring until almost incorporated. Mix in the chocolate chips and hazelnuts (if using) until just combined. Scoop out six mounds of cookie dough onto the baking sheet, evenly spaced apart. Bake for 10 minutes. The cookies will be set but still soft. Let cookies cool on the baking sheet set on top of a wire rack until set. Remove from baking sheet onto a wire rack. Enjoy at your leisure! Easy baking recipes like this are the best! So true...not only is it about the eating, recipes like these give you that baking "fix" you crave sometimes. 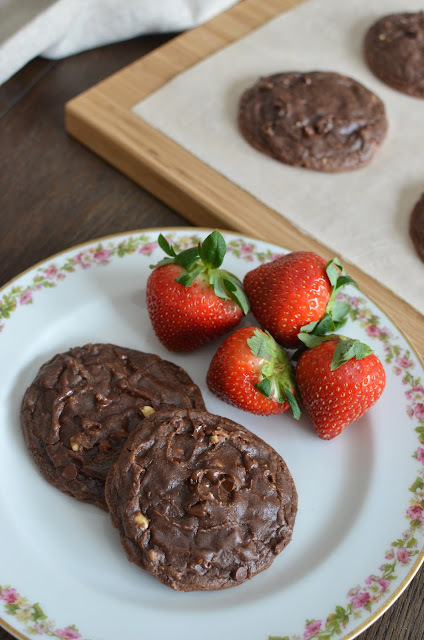 We always make room for chocolate :) The texture of these cookies looks wonderful. I can only imagine how delicious they must be. I just happen to have leftover Nutella from another recipe - so tempting! It's amazing how much chocolate we go through here! I better not think too much about it. : ) These are just fun to make...you know when you just want to go into the kitchen and bake something simple. I get that feeling all the time. These chocolate cookies look almost like brownie..must be very delicious with hazelnuts and chocolate spread. Yum! These sound so rich and decadent. I’m not sure I’ve ever used hazelnuts before. Do you mean nutella? Oh these sound sooo good! And huge plus for a small batch - I eat any treats sitting around too fast! :) haha Happy weekend Monica!! Anything chocoalte is droolicious in my dictionary. 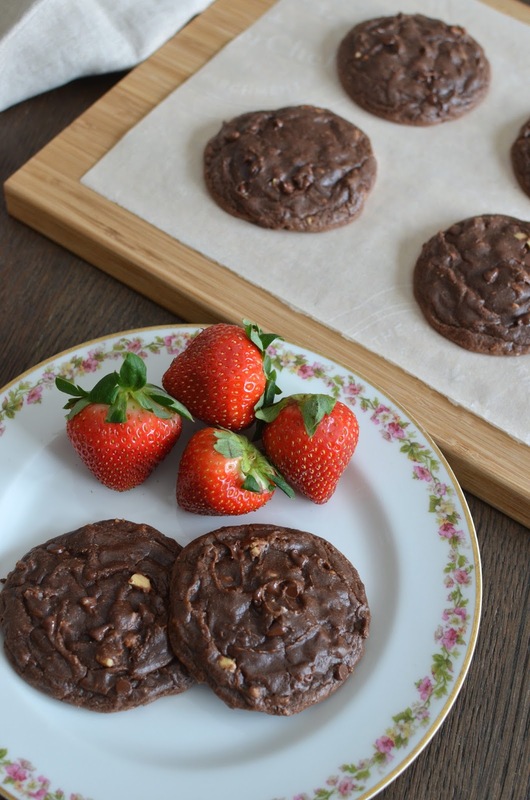 So I can tell I can swap my lunch for these fantastic chocolatey cookies. And so easy to make - definitely another plus. Hi Monica, these cookies sound right up my alley, I am always looking for recipes that have been paired down as it is just my husbasnd and I unless we have vistors, 6 is a perfect amount. And strawberries and chocolate is such a fantastic flavor combo, I bet your berries were fabulous, love simple and sweet. Have a wonderful weekend! I hear you - the small batch baking and Christina's recipes are great. Not only does it fit our small immediate family but it's nice to have an excuse to bake/cook more frequently and try other things. Have a great one! Hello Monica! I love your recipes (in addition to the pictures and the story of your day/weekend) because each time you put your personal touch. You adapt the recipes to your taste or your inspiration. I LIKE that. I wish you a happy weekend. Huge hugs. You are so kind, my friend. I don't always have the inspiration (or energy, or natural inclination) to be creative so honestly, I'm mostly just trying recipes as written. Once in a while, I make a little twist. I'm glad you like it and thank you again for the kind words. They make me smile. : ) Have a great weekend. Enjoy your leisurely Saturday routine!! Would that be the hazelnut choc chip cookies? I've made those and I remember them fondly but as you said, they involve more work so I haven't made them in ages. So very good though! These are different but so fun and easy for when you want just that. Thanks! I"m so glad you wrote about this cookbook - I love the idea of small batch desserts. I'll be sure to check it out! This is her 3rd cookbook. They are really great - simple and to the point, small portions - perfect for those looking for just that. I love the idea of easy and simple and soft cookies...these sure look great Monica...thanks for sharing the recipe! 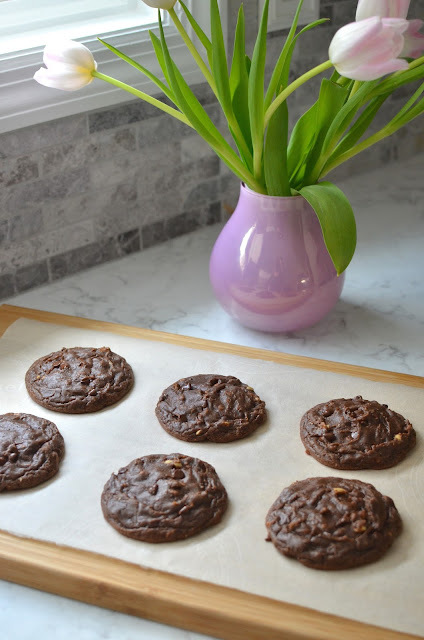 A recipe that only makes six cookies, perfect for just my husband and I.
I always appreciate a nice small batch recipe (: Chopped toasted hazelnuts is a brilliant idea, and the fudgy center sounds amazing. Hi Monica!! Lovely to see you pop up. These were fun and easy...great for busy people like you to whip up when the baking itch strikes. : ) Hope all is great with you! Take care now!